Hi friends! Hope you’re all doing well! It’s the end of the week and I’m guessing we’re all a little exhausted and struggling to come up with meal ideas? Well I know I am! So you’re in luck! I whipped up this gorgeous bright green bowl of goodness last week for lunch and also had some as leftovers for dinner, YUM! Dishes such as this one is absolutely perfect for those times when you’re just out of ideas but need to nourish that body of yours. You’ll also most likely have most of these ingredients already on hand which is even better! Probably not the soba noodles though, or do you? 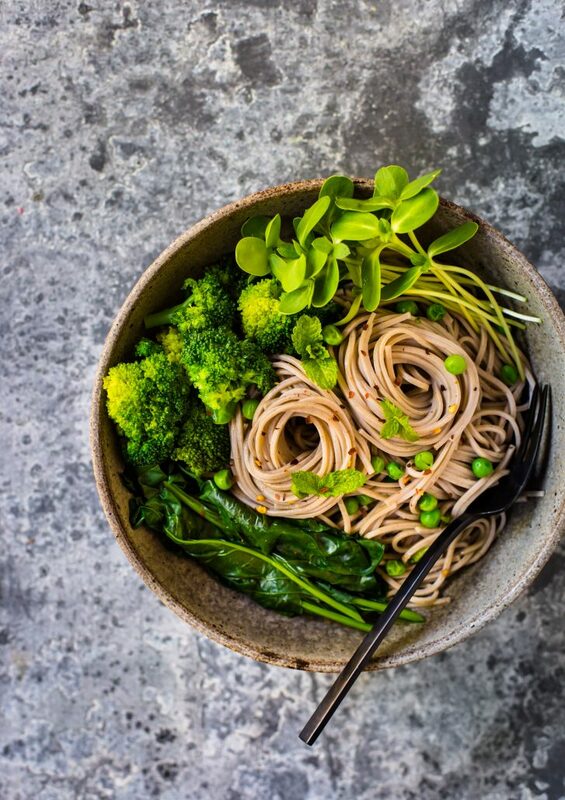 Have you ever tried cooking with soba noodles or ever even tasted them? Well if you’re like me, I wasn’t even aware of their existence until not that long ago. I had a recipe I needed to make for a client and it used soba noodles, which are made out of buckwheat flour, if you didn’t know. 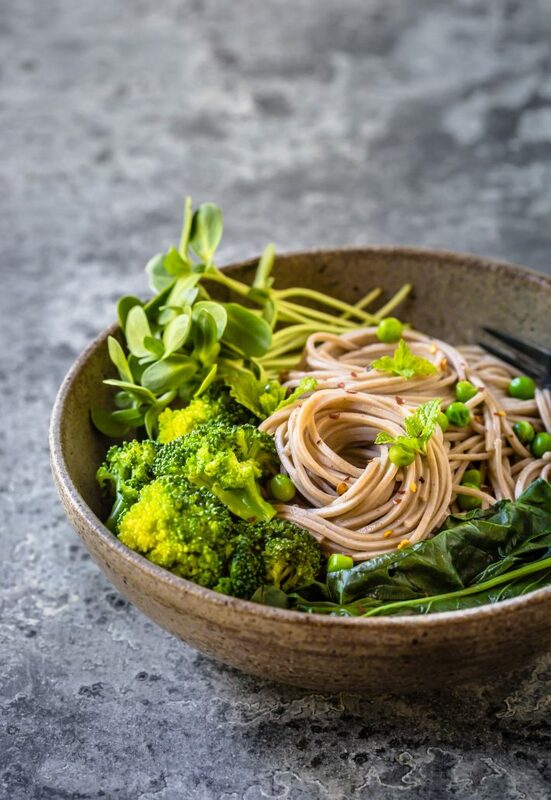 Just be sure to purchase soba noodles that don’t contain any other underlying nasties such as added wheat, especially if you’re gluten free because some brands do. Buckwheat is gluten free (despite it’s name) so just keep your eyes peeled on the ingredient list! The soba noodles are coated in extra virgin olive oil with a touch of fresh citrus juices from lemon and lime – amazing right? YES! Plus a sprinkling of chilli flakes (extra amazing!) but if you like a good punch of heat, simply add more chilli flakes to suit your palate. Topped with healthy steamed greens and sprouts and garnished with fresh mint leaves, now this is important, those fresh mint leaves are crucial! Well I love them anyway. They cut through the heat from the chilli and brings freshness to your palate. They just work so beautifully together. I hope you enjoy this healthy goodness bowl! Cook soba noodles according to packet instructions. NOTE: Time your noodles with the cooking time of your steamed vegetables so everything is warm when served. Or re-heat noodles in hot/boiling water for 30 seconds until warmed up again. Whilst noodles are cooking, prepare a steamer and bring to a boil. Once steamer is ready, place in broccoli florets and steam until just tender with a slight crunch. Before the broccoli is fully cooked and tender, add in thawed peas and spinach leaves, steam for a further 1-3 minutes or until all greens are tender or cooked to your liking. Remove from heat. Place cooked soba noodles in a mixing bowl and drizzle over oil, citrus juices and chilli flakes. Gently mix using your hands or tongs until all the noodles are coated well. NOTE: If you want more chilli flakes, simply sprinkle in more for extra heat! Place noodles in a serving bowl/s and top with steamed vegetables and fresh sunflower sprouts. Sprinkle over extra chilli flakes if desired and garnish with fresh mint leaves. 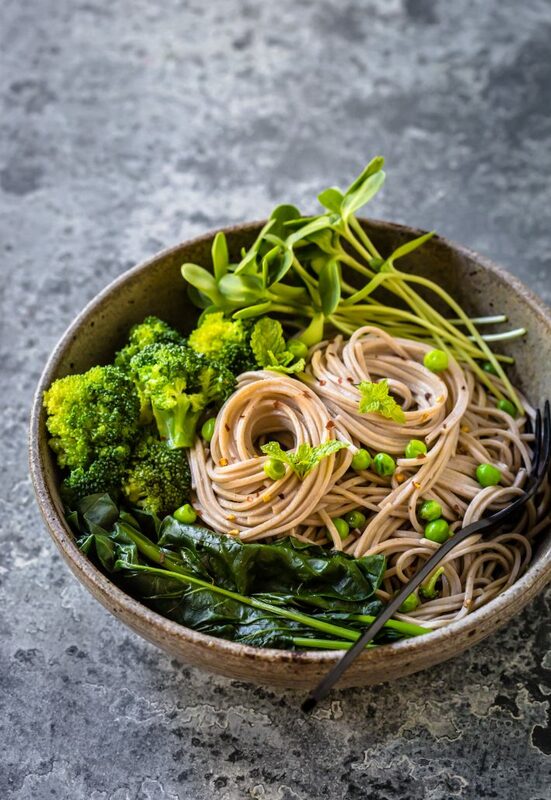 *Find soba noodles from your supermarket or local health food store. **You can find sunflower sprouts from your local health food store, supermarket or you can grow your own.